I was able to read an arc of Love, Hate, and Other Filters in exchange for an honest review via Edelweiss+. “In this unforgettable debut, a Muslim teen copes with Islamophobia, cultural divides among peers and parents, and a reality she can neither explain nor escape. It’s safe to say that the arc of Love, Hate, and Other Filters is one of my favorite reads of this year. First off, it’s extremely realistic and needed, especially in this day in age. As a Muslim teen, there were so many times where I was just floored by how realistic not only Maya was, but also the entire plot of Love, Hate, and Other Filters. It’s clear how much time, energy, research, and heart that Samira Ahmed put into writing Love, Hate, and Other Filters. I adored Maya as a main character. She’s spunky, a bit insecure, and knows what she wants but doesn’t want to hurt anyone to get it. I honestly want to be friends with her. Her relationship with her immigrant Indian parents is complex, messy, and again, full of life. Maya is now one of my favorite YA characters, and I was inspired and deeply moved by her and her story. The theme of family is an important one that’s present in Love, Hate, and Other Filters, and it definitely helped to tie the story together. Samira Ahmed’s storytelling and writing style are awesome. The way she sets up the story and includes a certain perspective ( I don’t want to give it away), added so much depth to the story as a whole. It was humanizing, and I’m so glad she added that perspective. The romance(s) in this book crushed me, especially the ending. As a whole, Love, Hate, and Other Filters played with my emotions. I was tearing up one moment and swooning another. I honestly have nothing negative to say about Love, Hate, and Other Filters. Everything from the plot, to the characters, to the pacing, to the message, worked and resonated with me as a reader. I’m so incredibly grateful that I had the opportunity to read the arc of this amazing book. It’s a must-read, and one of my most anticipated 2018 releases. In short, READ IT!! 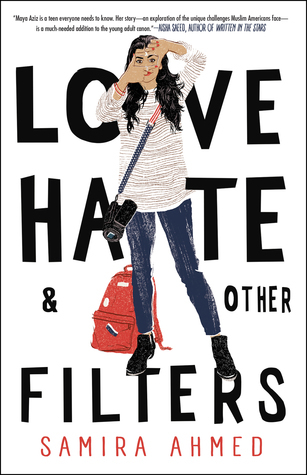 5/5 stars, and I can’t wait for Love, Hate, and Other Filters to be released in January. Next Post Writing Update: So Nanowrimo Starts Next Week?! Great review! I got this in the mail a few days ago AND AM SO EXCITED!! You’re lucky! I can’t wait to read it now. That was a lovely review!!! I was also able to get an eARC *squeals*, and will be starting it very soon! So far, I have seen nothing but glowing reviews, so I have really high expectations for this book. Thank you! I can’t wait for you to read it.